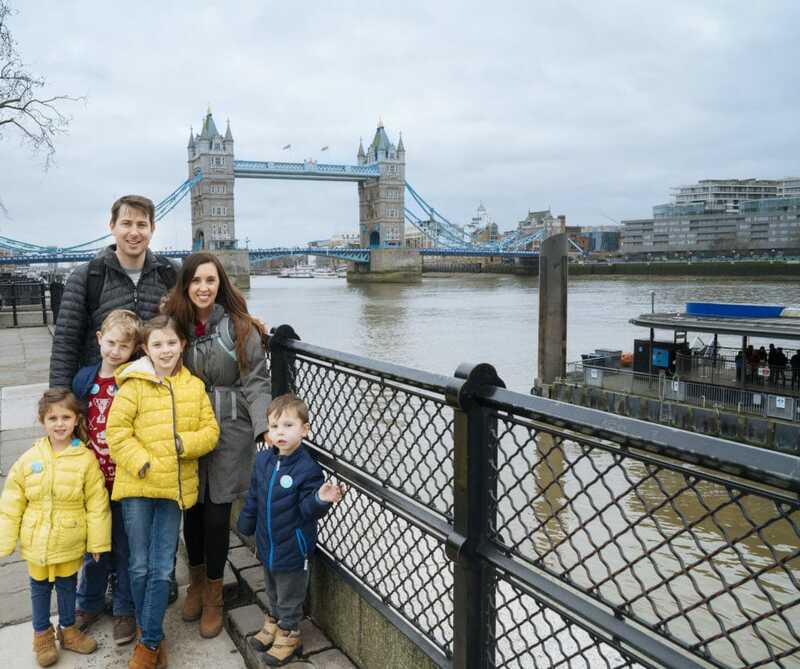 Have you been to London with kids? It is such a great family-friendly destination! It’s my personal favorite city and pretty high up there for my family! There is so much history and culture in one place and children are really valued. One thing to address before I get started is the weather. I always tell people that London is a great place to visit ANY time of the year because you can have bad weather ANY time of the year! Ha! We were there in December & January and again in June. Some days it felt about the same! Just be prepared and pack a rain jacket, good waterproof walking shoes and layers! I’ve compiled our favorite things about London. Some of them are pretty obvious, but you might find a few surprises. 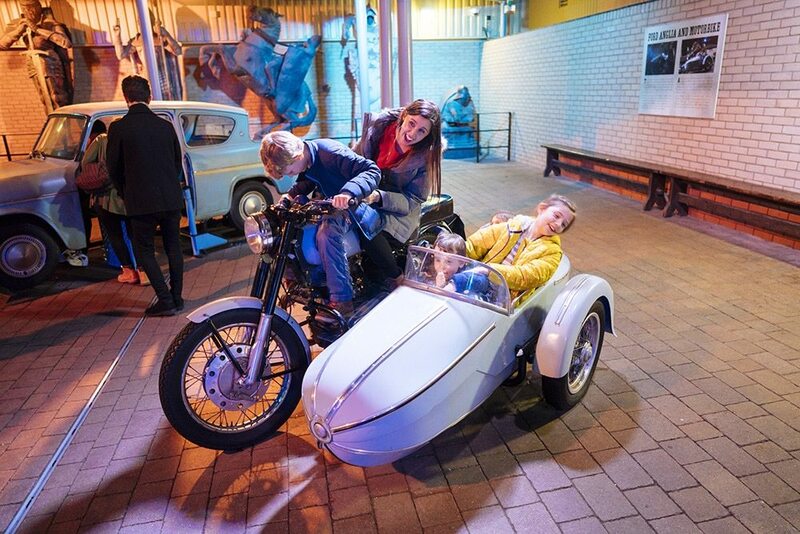 Here are the top 20 things to do in London with Kids! 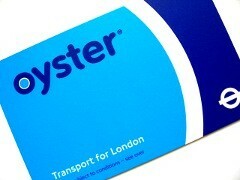 Buy an Oyster Card: This is like a credit card that that you can top up when it runs out. These cost 5 pounds to purchase and money can be added to it as often as you like. They work on the underground, bus systems and some National Rail. 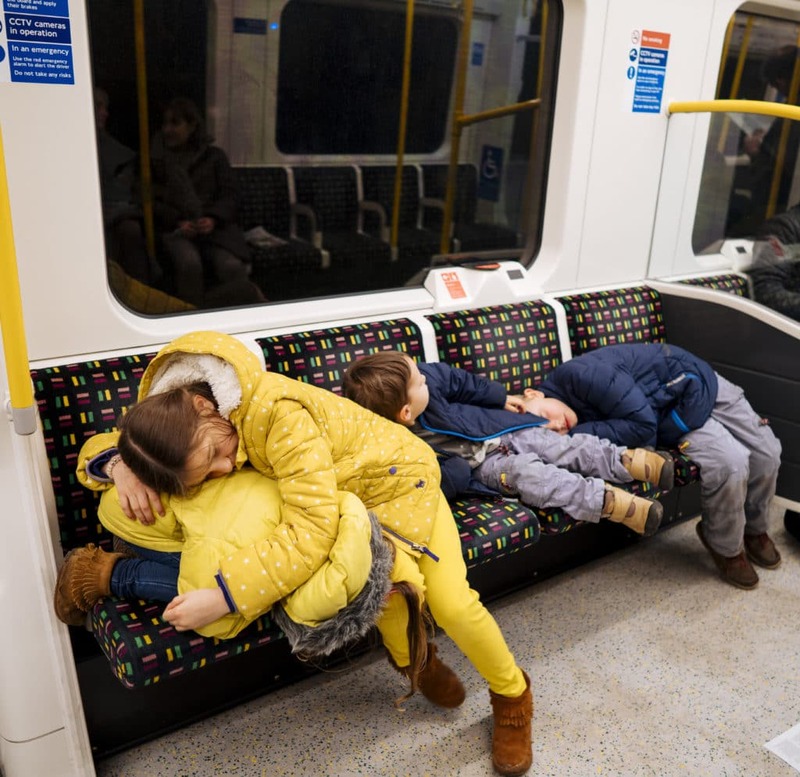 Children 10 and under ride the bus and tube for FREE! Just one more reason to love London! Download Google Maps App and use it! Even if you have to look up directions before you leave free wifi. I recommend using google maps public transit directions. These have almost never failed me! 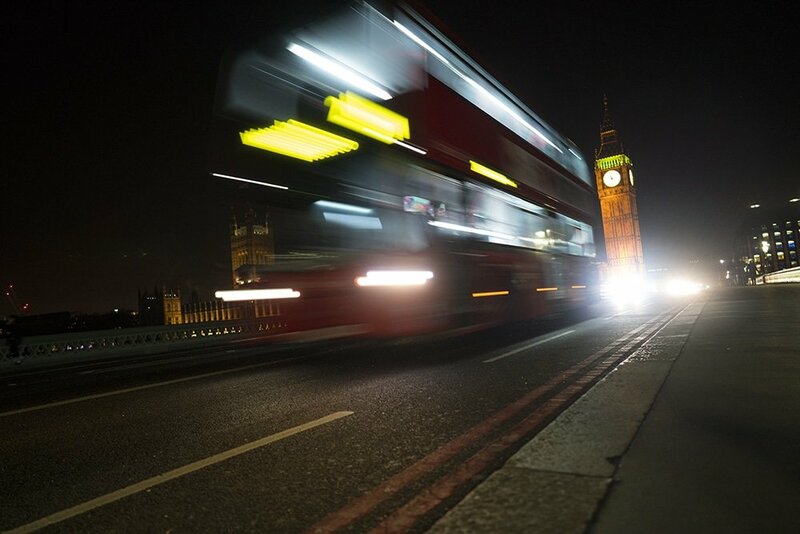 Take the Bus: Our preferred method of transport is the red double decker buses. They are clean, efficient and plentiful. If you miss the bus, don’t worry, there will be another in about 2 minutes. The system can be a bit complicated, so again, I recommend google maps! The best thing about buses with little kids is that if you have a stroller, you can just roll them right onto the bus and keep the stroller up if it’s not too crowded. But I recommend going up to the top in the very front if you can. You’ll get an amazing view of the city! 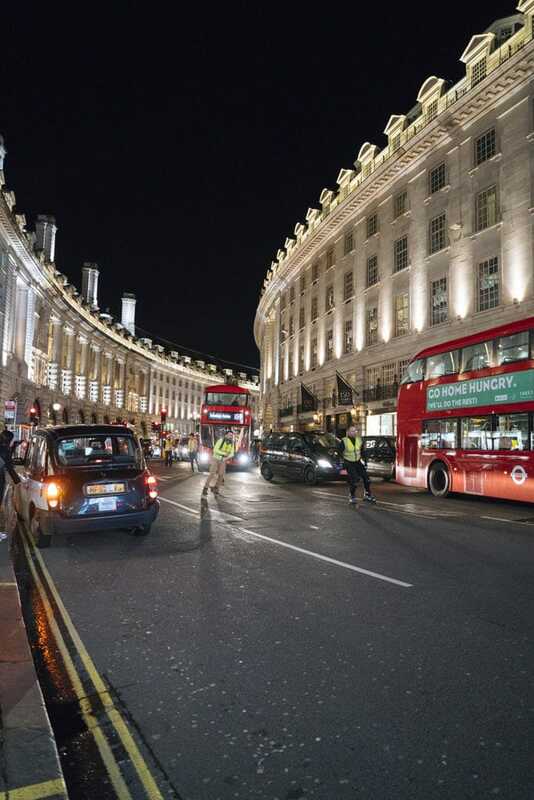 Take a Cab: Of course, don’t leave London without getting a ride from a London Cabby. The cabbies have to take a difficult test to get the job. It can take years to study and pass the test. They have to know the streets of London like the back of their hand! If you want to know about something you pass, ask the cabbie, he most likely knows a bit about everything! They are also some of the nicest people I’ve ever met and most of them absolutely love their job! 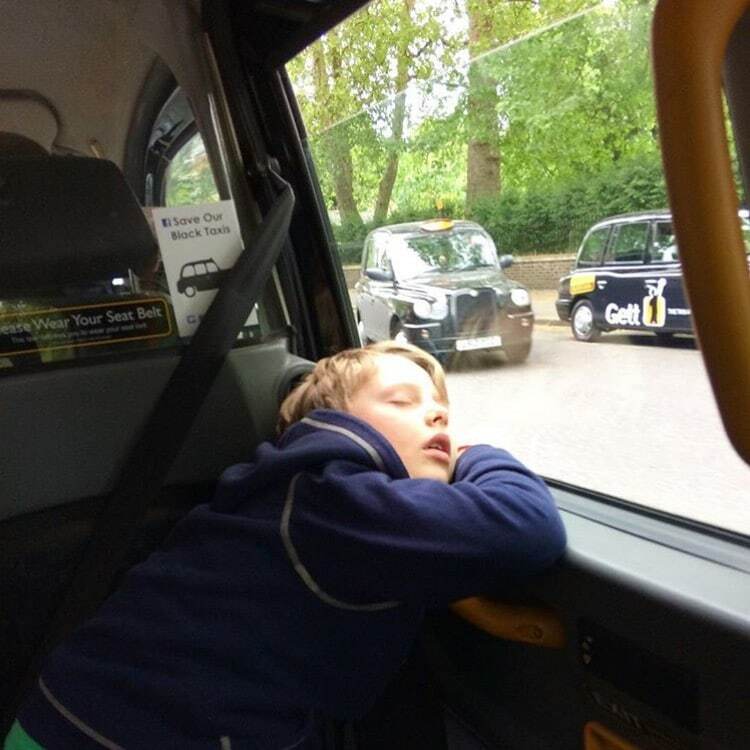 We rode in one cab and asked to go to Kensington Palace. He asked if we were going to visit or if we were guests! Haha! I guess the week before he had taken the Duke of something or other there to meet with a member of the Royal Family! You just never know who you’ll pick up in a cab! Cabs have 5 seats in the back. They can get quite expensive so we try to save them for a rainy day (literally). We have a crew of 6 so we’ve had a few cab’s turn us away, but for the most part they’ve never had a problem. Some cab’s take cards, but about 80% of the ones we took were cash only. It’s always a good idea to go to the passenger window of the cab before getting in and telling them where you’re going to be sure they are willing to go there, especially if it’s far. It’s just a common curtsey. When the Taxi sign is lit, the cab is empty. UBER: UBER has a good presence in London, but I’ve found the cost of taking a cab to be about the same, unlike other cities where UBER can be significantly cheaper. But if you can’t hail a cab, then it’s a nice backup! Walk: Check distances on Google Maps. Sometimes things are closer than you might think and London is a fun city to walk around. You never know what you might see along the way! This is an obvious one of course. Beware that it is expensive and the lines are long and slow! You do get a great view of the city. I recommend getting tickets at least several days in advance and getting the priority tickets if you can afford it. The lines are worse than Disneyland! They Eye goes slow and some of my kids found it boring, but some of mine wanted to go again! I’m 50/50 on this one. Also, that hotel behind the Eye is called the Marriott County Hall and it’s my favorite hotel ever! We’ve stayed there a few times and it’s just the best! 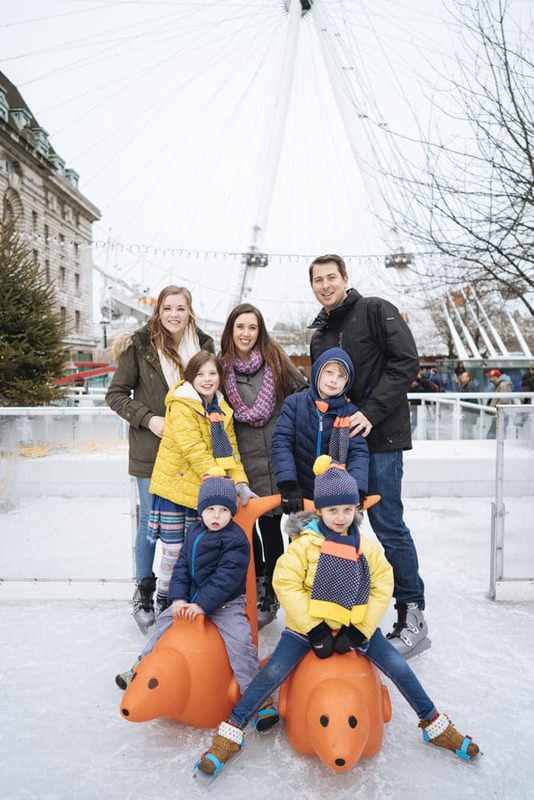 If you’re lucky enough to be in London during Christmas or wintertime, you can include “eye-skating” in your London Eye ticket. It’s a tiny rink and crowded and you can only skate for 45 minutes, but it was just right for our novice skaters (my kids, not my husband, who thinks he’s Wayne Gretzky). Plenty of little push/ride seals for the little ones (and maybe for me). Another obvious one, but you have to see Big Ben! 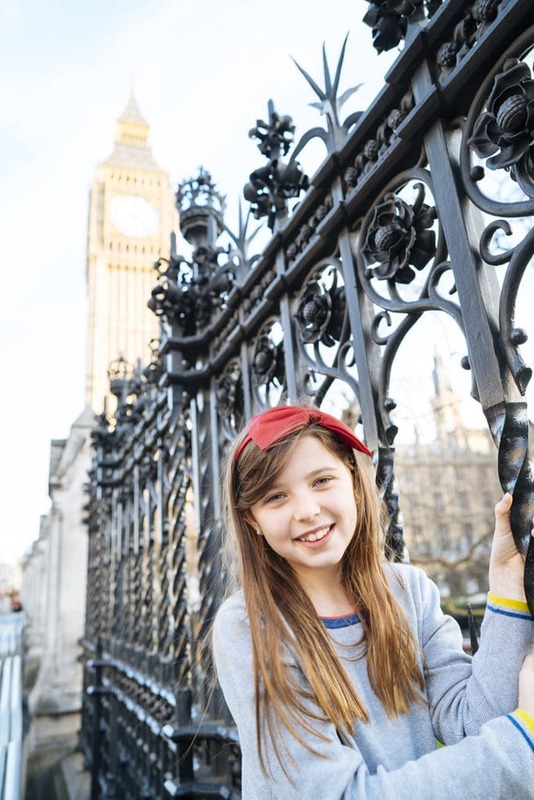 “Big Ben” is actually the name of the bell inside the tower and the tower is called the Elizabeth Tower. 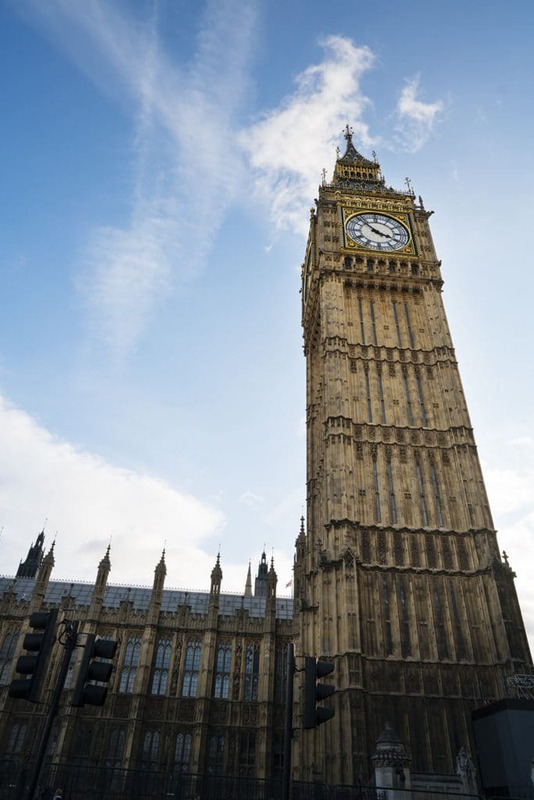 But everyone lovingly refers to this part of the houses of parliament as “Big Ben” and it’s one of those iconic pieces of architecture that does not disappoint in real life. 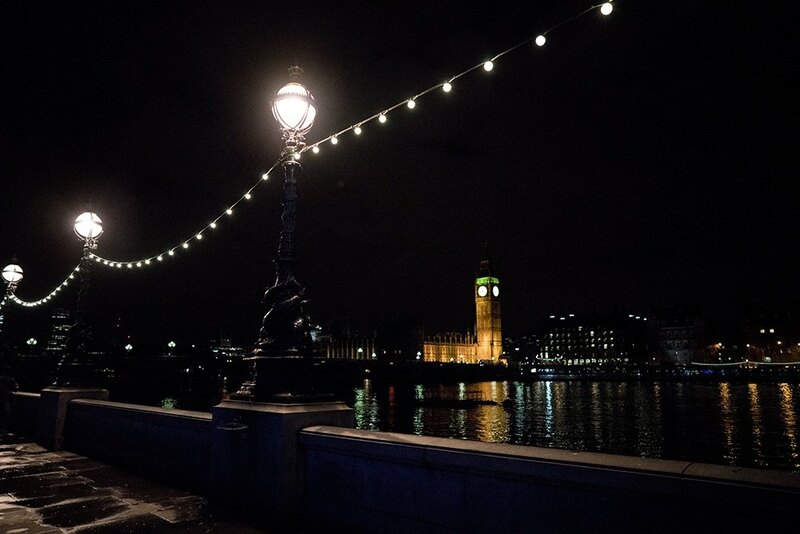 The best views are found on Westminster Bridge. Watch out for selfie sticks! 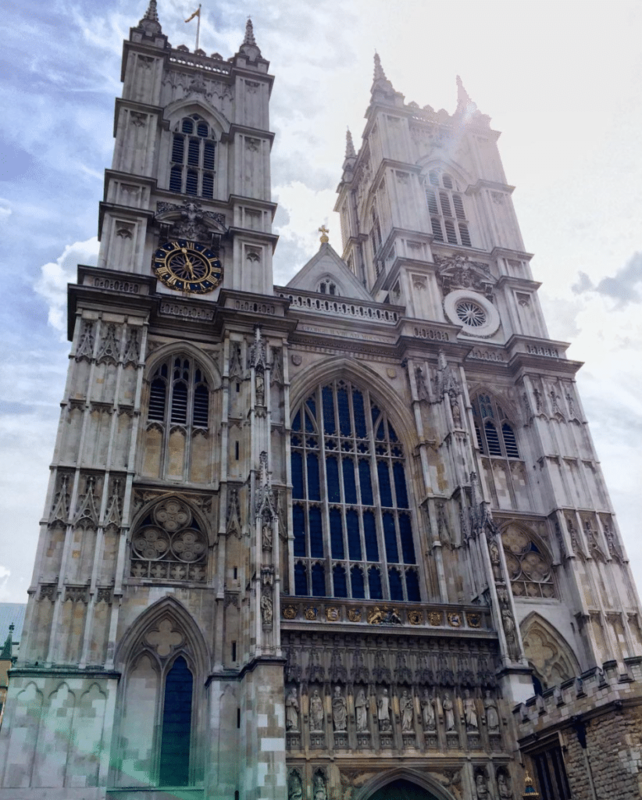 So much history is found at Westminster Abbey. If you are interested in British history or literature at all, your must visit. Tickets can be pricey, but we purchased a Family Ticket which was about 40 pounds. I was a little nervous about taking the kids here, but they did pretty well. They have a “Children’s Trail” which you will find at most historical places in London. It is like a little worksheet/map for the kids. They also have a children’s Audio Tour. The volunteers here were just incredible with the kids. 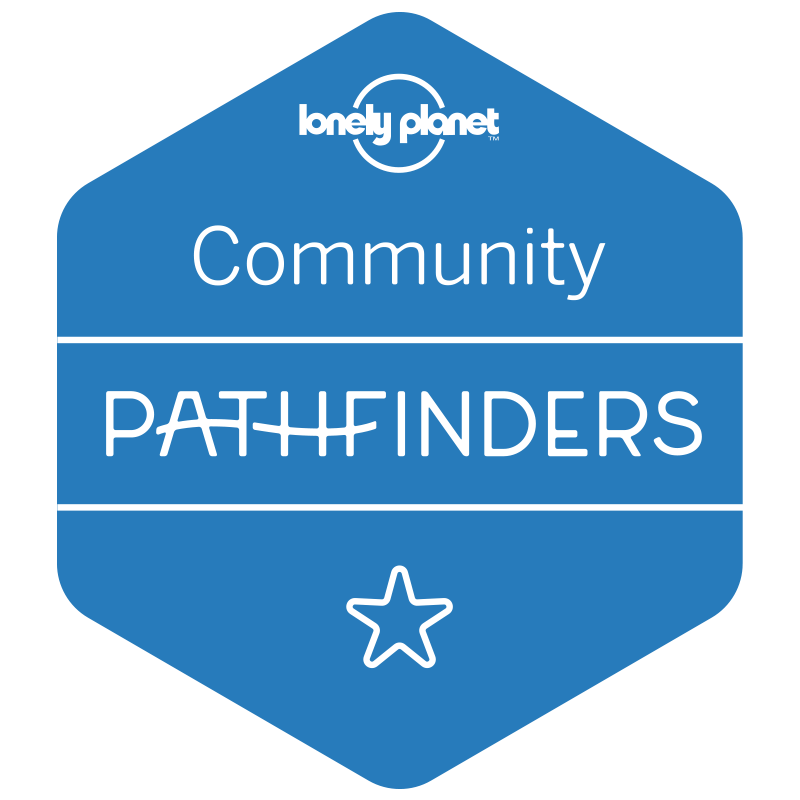 Most of them are senior citizens with a love for the place that shows. We actually had a priest come and take our kids up to sit in the quire (yes that’s how they spell it) and show them where the choir boys sat and sang when the Queen was crowned and when William and Kate were married. It was pretty memorable! Referred to as “the office” by her majesty the queen, Buckingham Palace is a must-see when you go to London. While the changing of the guards is really interesting to see, it is extremely crowded and unless you put them on your shoulders, your kids will see none of it! I used a selfie stick just so I could SEE over the mass of people! 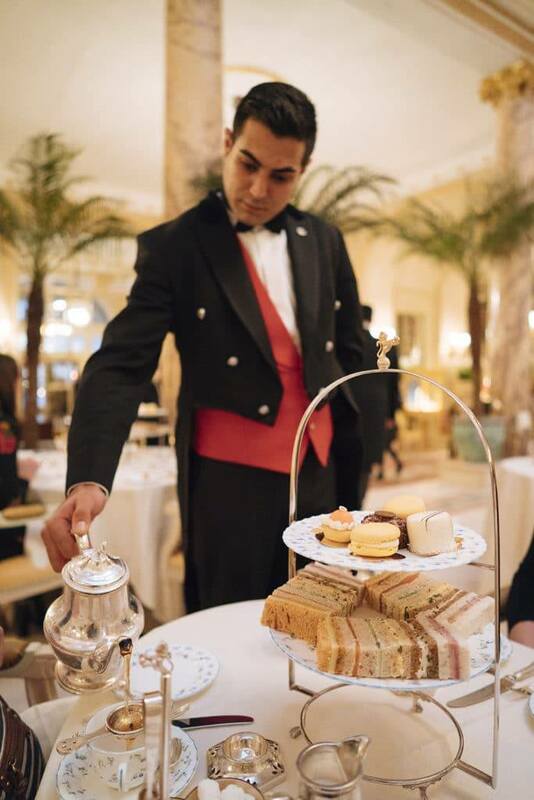 Maybe skip the changing of the guard and see the palace just before sunset, then turn right and take a stroll through Green park and head to Piccadilly Street for some dining and shopping in the evening. 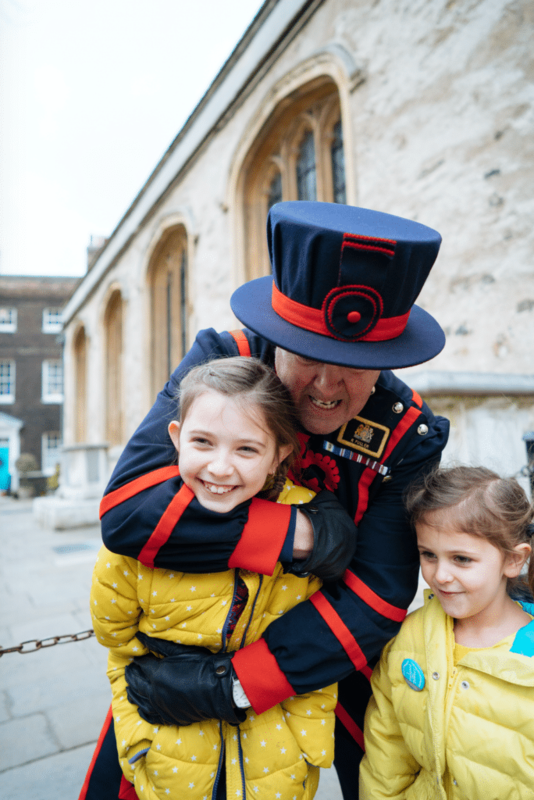 This is such great place for kids and if yours have the attention span, be sure to take the free Beefeater tour. Beefeaters are the guards at the Tower. I originally thought they were just tour guides in costume, but they are all decorated military veterans. Learn more about the Beefeaters here. We had Billy the Beefeater for our tour (you can follow him on instagram @billybeefeater). Not only was he a decorated vet, but he also had a degree in medieval military defense so he really knew what he was talking about. What an amazing job for this guy! The beefeaters live on site at the Tower and it is a very sought after and respected position for retired military. So don’t treat them like just tour guides! 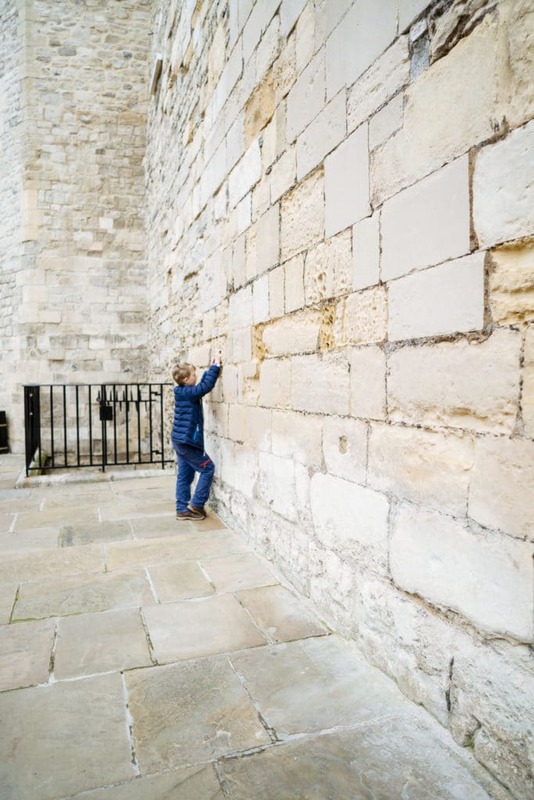 After the tour you can see the crowned jewels, learn about the old zoo at the tower and the interesting stories that went along with that (kids love this part), see how prisoners were tortured, and look at the collection of thousands of antique weapons inside the white tower. There are usually characters in costume roaming around and acting out little scenes. Several gift shops and restrooms are also dispersed throughout. Be sure to checkout the ravens that guard the tower. Legend has it that if they leave the Tower then England will fall! 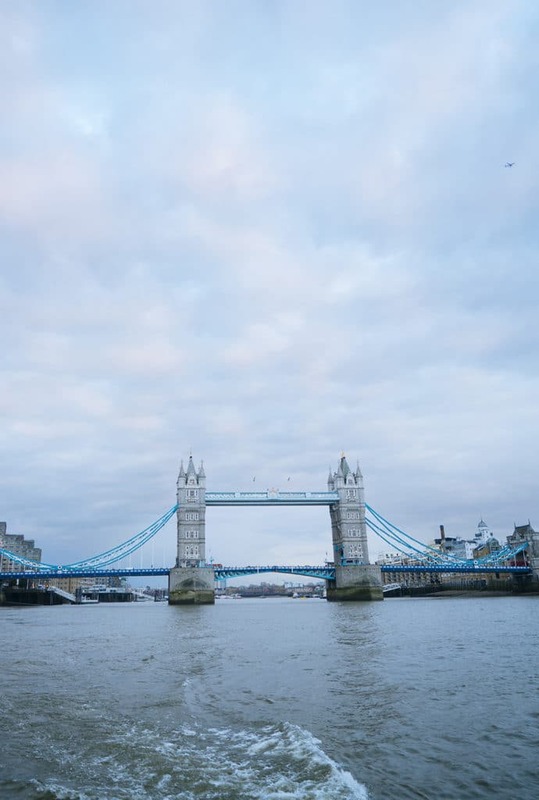 While you’re at the Tower, be sure to take a picture with Tower Bridge and check times to watch it open here. 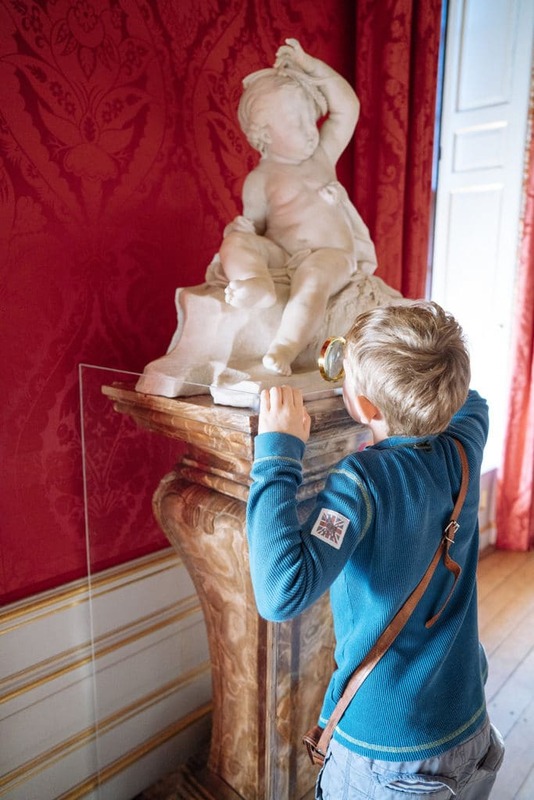 Probably our favorite historical thing to do in London is Kensington Palace! 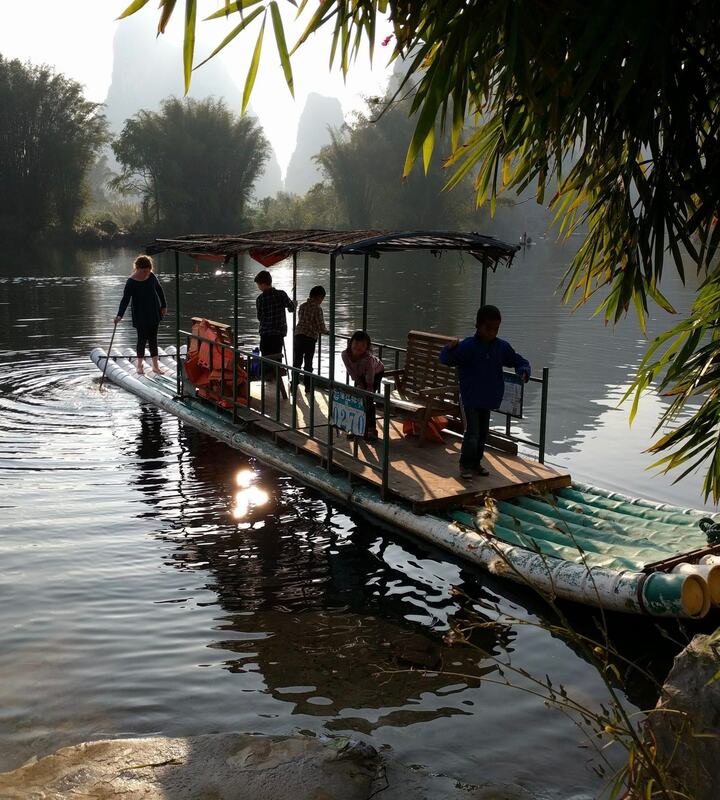 It has such wonderful feel to it, is small enough that you can explore the whole thing in a few hours, and is very interactive! 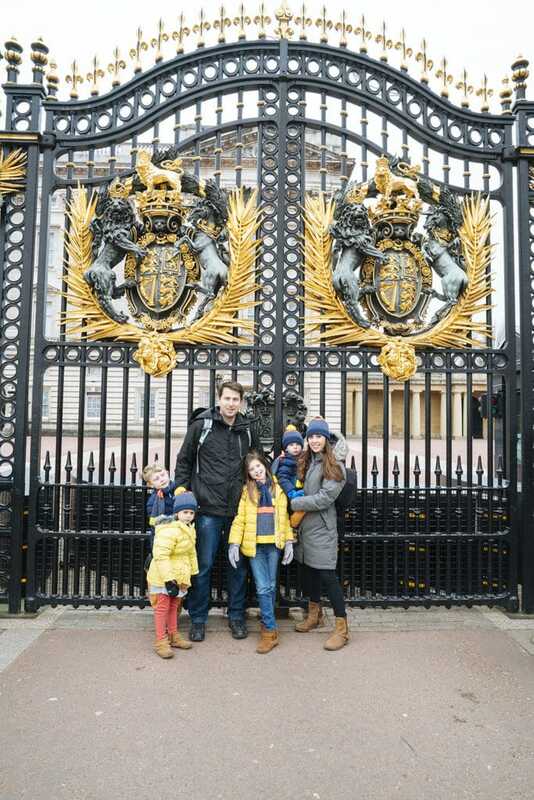 The self guided tour covers several hundreds years of British history from William and Mary to William and Kate! 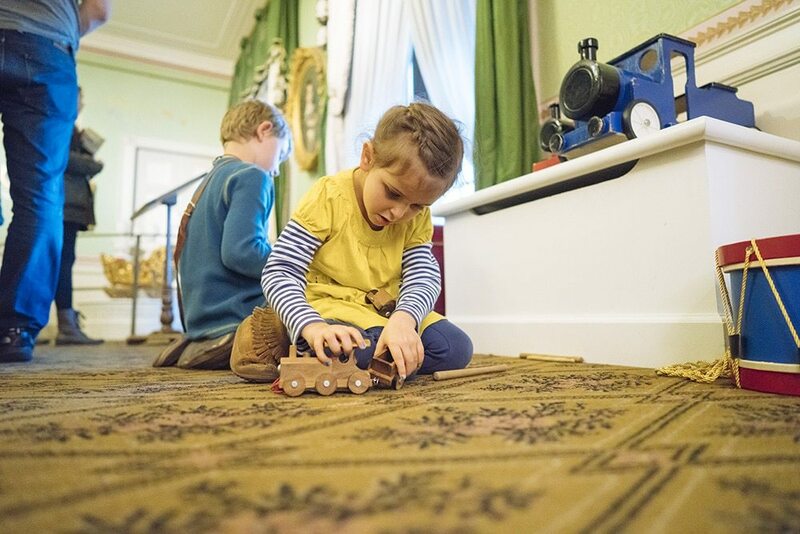 There is a sweet little children’s room where kids can play with toys and see artifacts from Queen Victoria’s children. 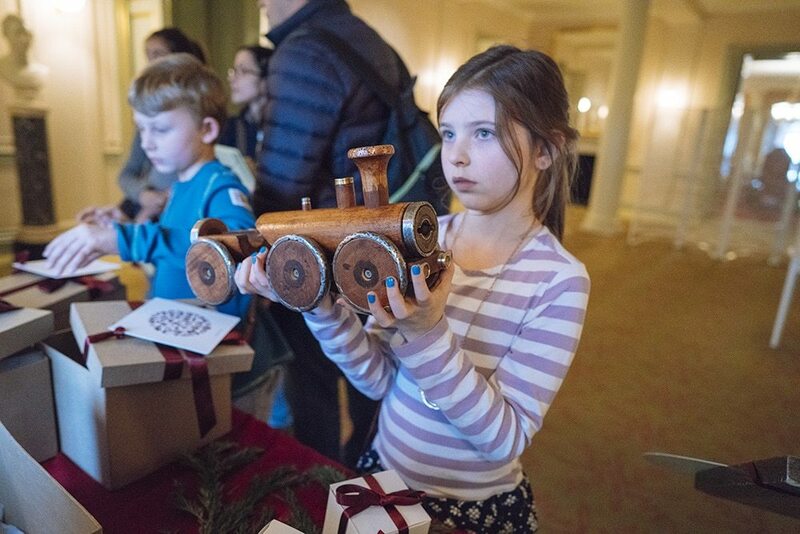 In another area you can play table games and try on period clothing! It’s just so much fun! And my favorite section is fashion where they have dresses from queens and princesses past. So much fun! I recommend watching Young Victoria before going. 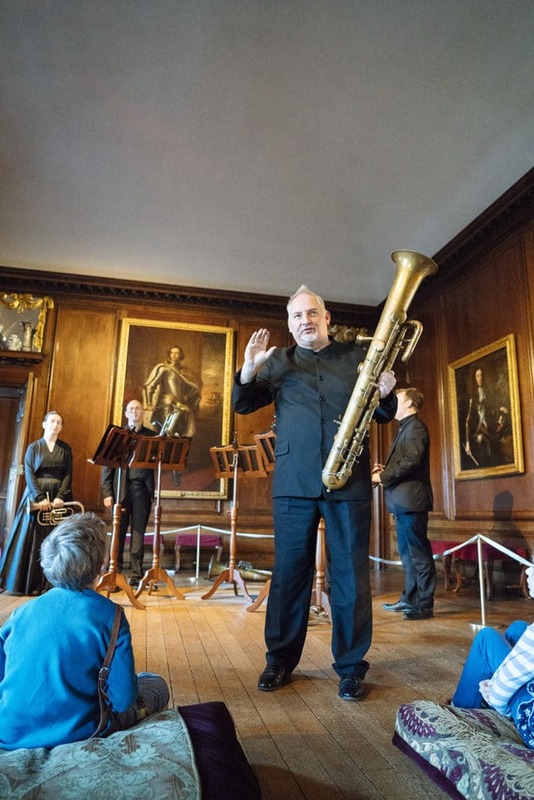 *NOTE: If you plan to visit The Tower of London AND Kensington Palace or Hampton Court Palace, Kew Palace, Hillsborough Castle, or Banqueting House and you have a large family, then I highly recommend you get a Historic Royal Palaces annual pass. Even if you go to each location once, it might be cheaper. 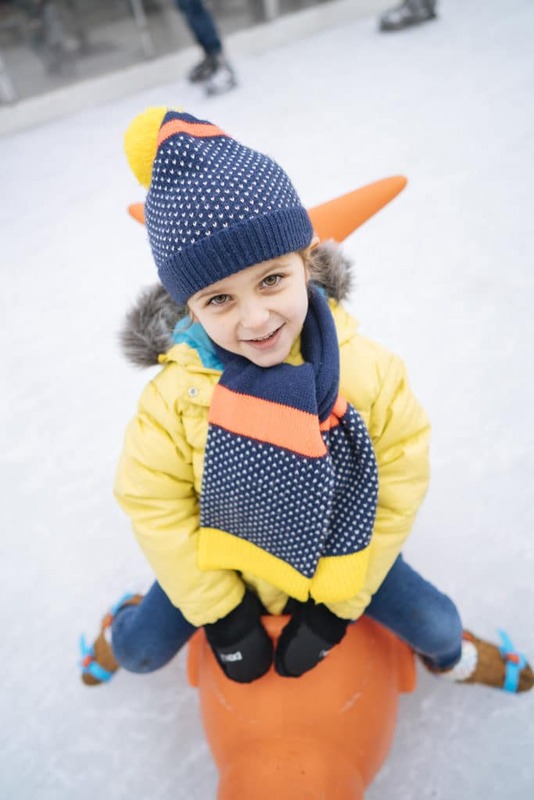 Diana Memorial Playground in Kensington Gardens: Our favorite playground in London, this is a great place to go after touring Kensington Palace. 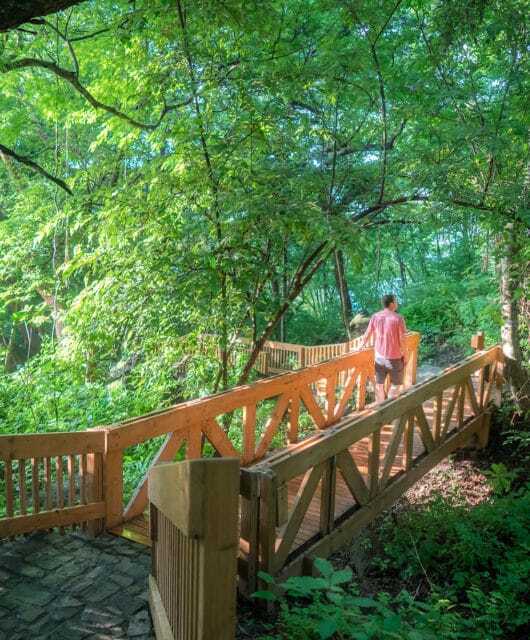 Whatever you do, do not miss this park! Your kids will remember it forever. 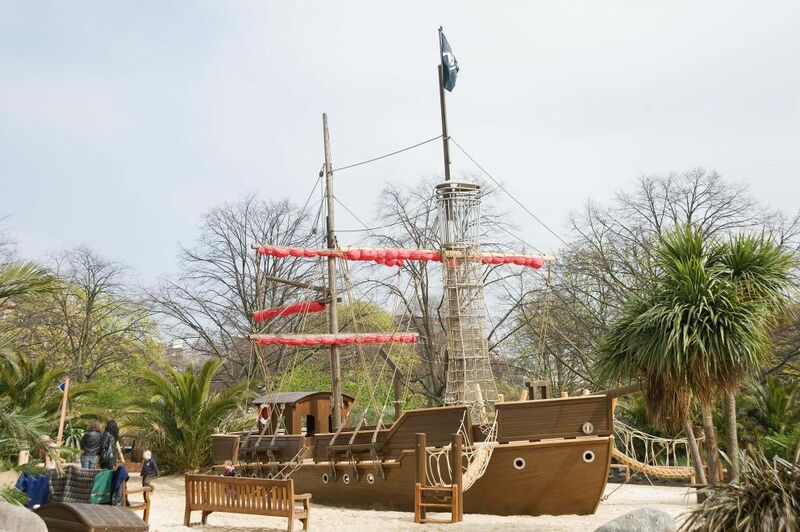 It has an adorable Peter Pan theme with a pirate ship, tee-pees, beach and lost boys’ fort. It is pure magic! The park is gated, but entrance is free. There is also carousel outside the gates and a snack bar. Also, bathrooms located inside the gates…always good to know! Battersea Park: A great park on the Thames with a playground, row boat and bike rental, and train. 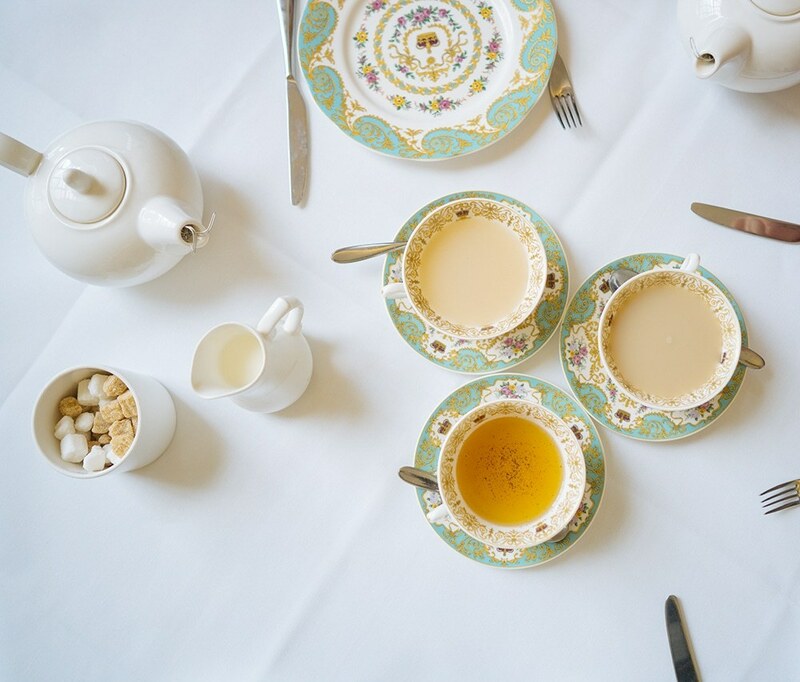 The Orangery at Kensington: A great place to go for tea after you’ve toured Kensington Palace. Very fancy, but not as fancy as the Ritz so don’t feel like you have to dress up. I went in jeans and a flannel and they didn’t kick me out. The food was good, the tea lovely and the service great! You can order other food besides afternoon tea as well. Also home of my favorite china! 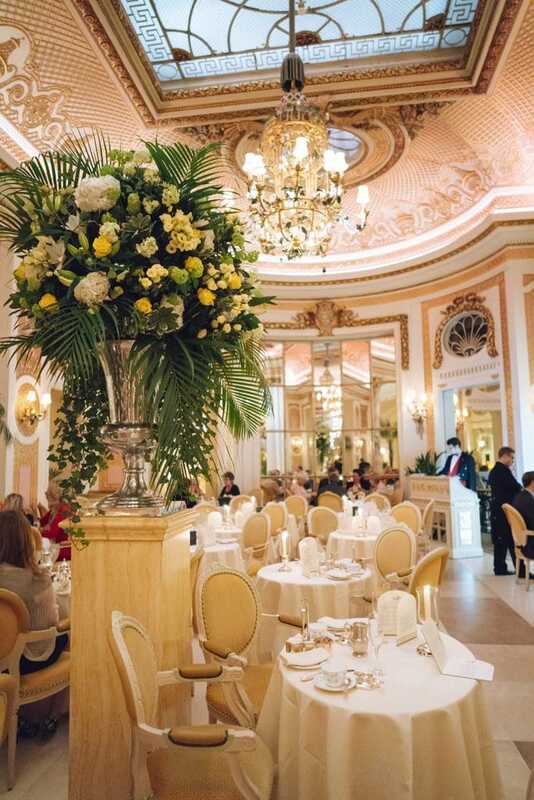 The Ritz: If money is no object, we love tea at the Ritz. Book several weeks or months in advance. It will cost you about 50 pounds or $75! But they bring out unlimited delicious food and tea, and have excellent service. If you want to do a fancy tea and have the pounds to burn, I think it’s totally worth it. Pick a later time so it can count for dinner. You will be full to the brim! This is generally a fancier dress up occasion and we did see lots of other kids there! London is NOT a cheap city, especially being an American with a crummy exchange rate, but it’s fun to at least do some window shopping. Liberty has fun products and adorable fabrics. 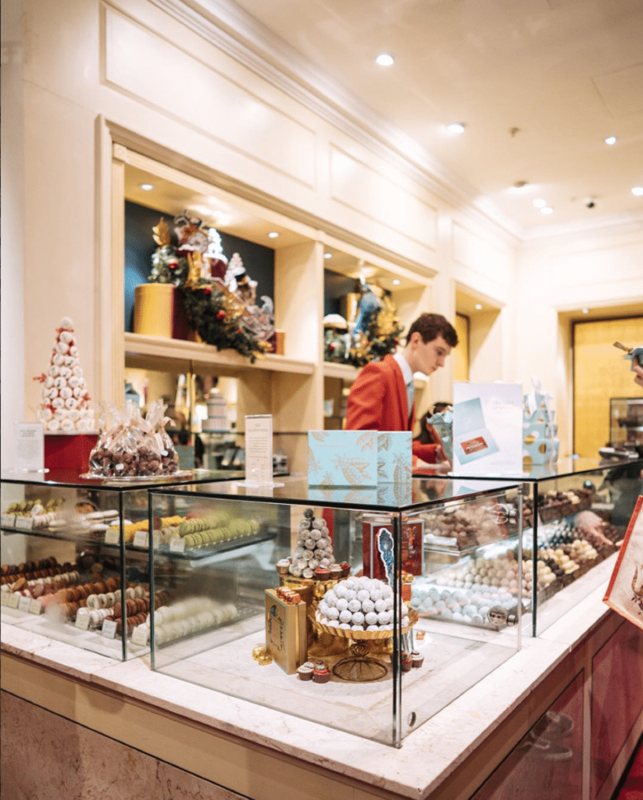 Fortnum & Mason is my absolute favorite and is full of gourmet food, teas, sweets and beautiful tea sets and other kitchen accessories that you won’t be able to live without once you see them! DO NOT MISS the bottom floor which is the gourmet grocery store. They almost always have samples out! Grab some fancy cheese and crackers and something from the chocolate counter and have a little picnic! Be sure to catch the clock outside the shop on the hour and half hour when Mr. Fortnum and Mr. Mason come out to bow to each other. Portabello Road You could actually spend days here (we did) just wandering up and down Portabello Road. The song from Bedknobs and Broomsticks really is true! Have the kids watch it before you visit. Street where the riches of ages are stowed. 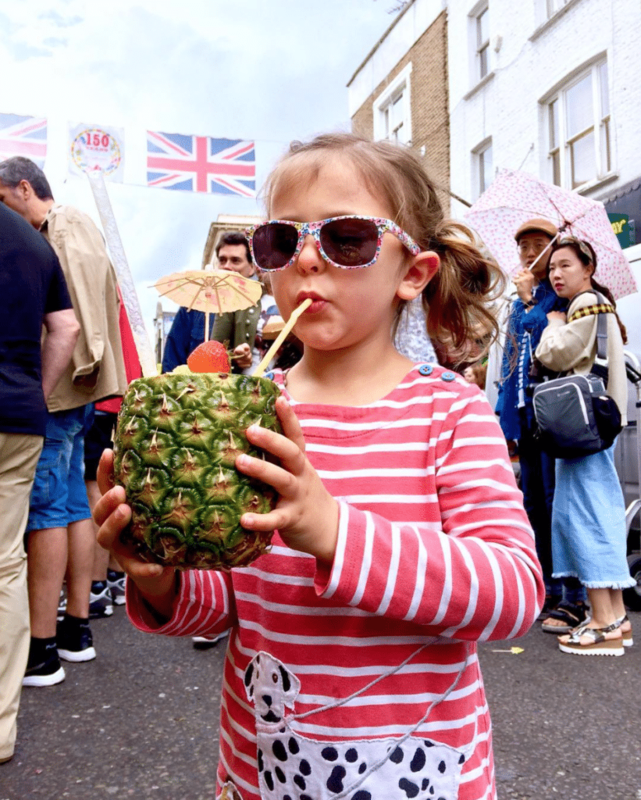 Serious antiques, retro fashion, diverse food, street performers…it’s just incredible. 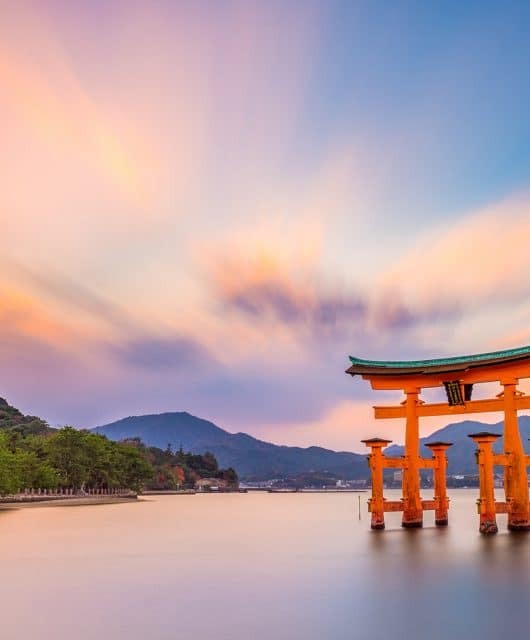 It’s a bit of a trek from the city center, but totally worth it. I recommend going on a Friday. All the shops are up, but it’s not as crazy as Saturday! Harrods is hard to describe. It’s like a giant department store on steroids. They have an entire floor dedicated to toys! They always have toys out for kids to try so my kids have a blast there, I just have to prep them that we aren’t buying anything! Selfridges Like Harrods, a massive department store. If you’ve watched the BBC show Mr. Selfridge it’s worth a visit. At Christmas time Santa walks around and you can get free polaroid pictures with him. Brick Lane is full of fun clothing. Some vintage, some…not! Interesting people too! Stanford’s Travel is the cutest little travel shop! 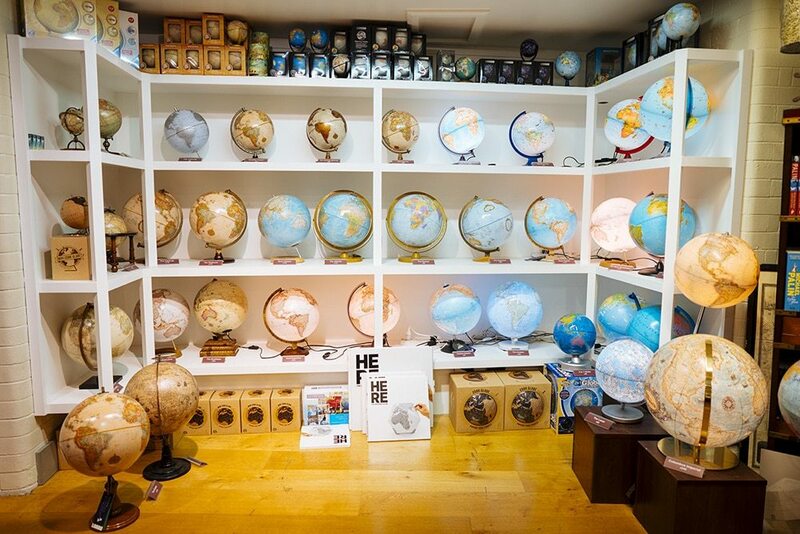 Full of maps and globes and other travel related items, it is a must see! 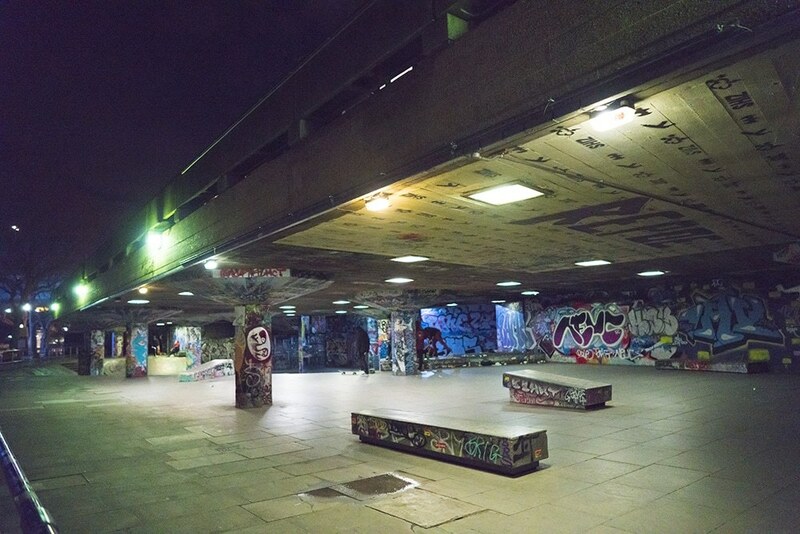 There are so many amazing places to eat in London. I wish I had the time and appetite to try them all. There is literally something for everyone. It’s not just “British food,” you can really find food from all over the world…just follow your nose. Indian food has a big presence here as well as Asian food of all types. Not specifically a London fare, but we love Wagamama, a healthy Asian-fusion restaurant with great options for kids. There is one right by Kensington Palace. 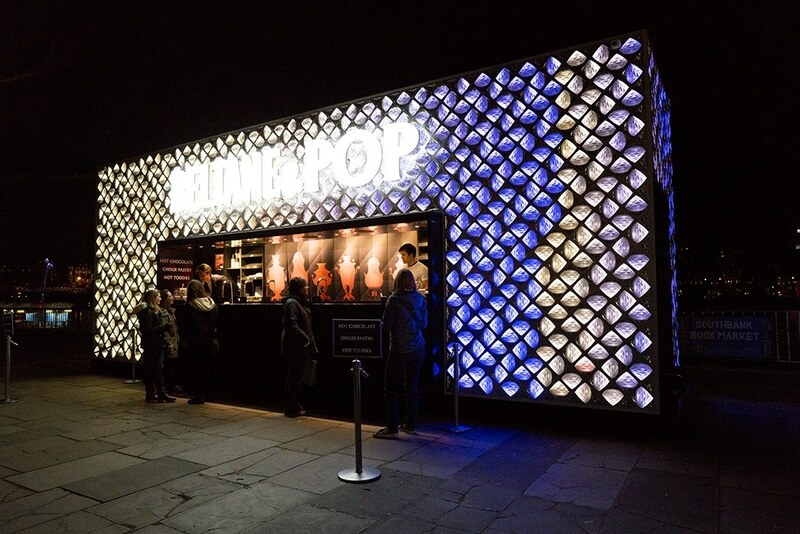 If you are a Jamie Oliver fan, this is the place to be. He’s got a retro diner, Italian restaurant and more all around town! We love his food! Pubs If you’re from the U.S., this probably isn’t the first place you would think to take your family to eat, but the pub food in London was mostly fantastic and the atmosphere was great for kids, as long as they weren’t too busy. Most pubs also have more formal dining areas usually upstairs. 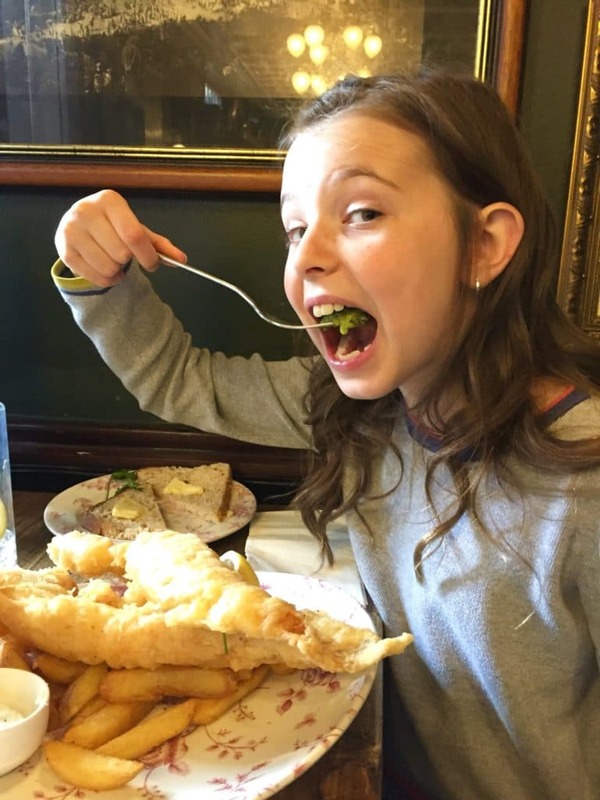 Some of our pub favorites include steak and ale pies, chicken pies, lamb with mint mash, fish ‘n’ chips with mushy peas (just try them, they are my 10 year old’s favorite), toffee pudding, and if it’s around Christmas time, you MUST try Figgy Pudding, which is our family’s new favorite dessert…EVER! 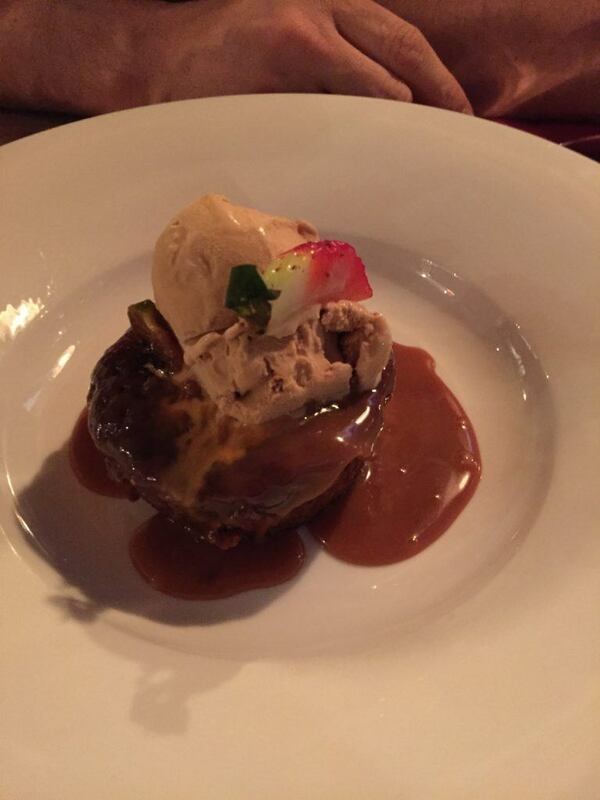 Figgy Pudding…it tastes so much better than it looks or sounds! 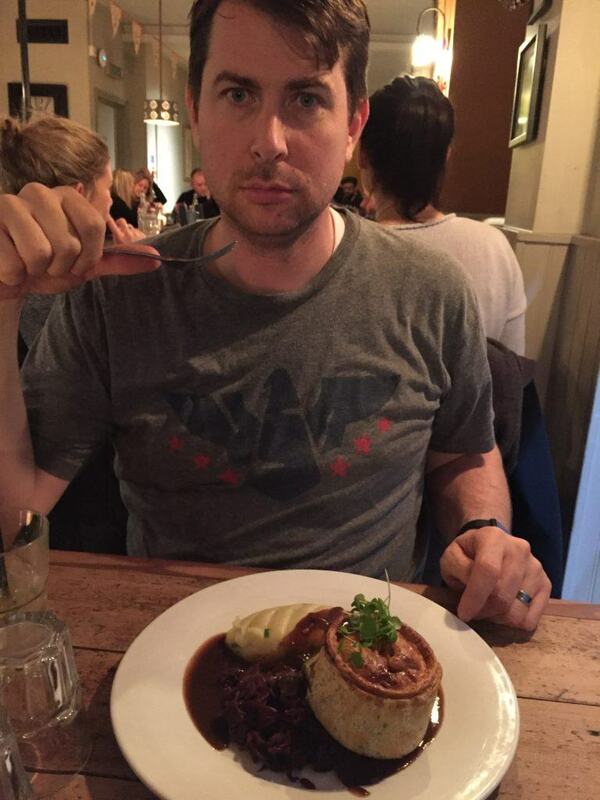 Chicken & Leek Pie…pub helpings are always HUGE! 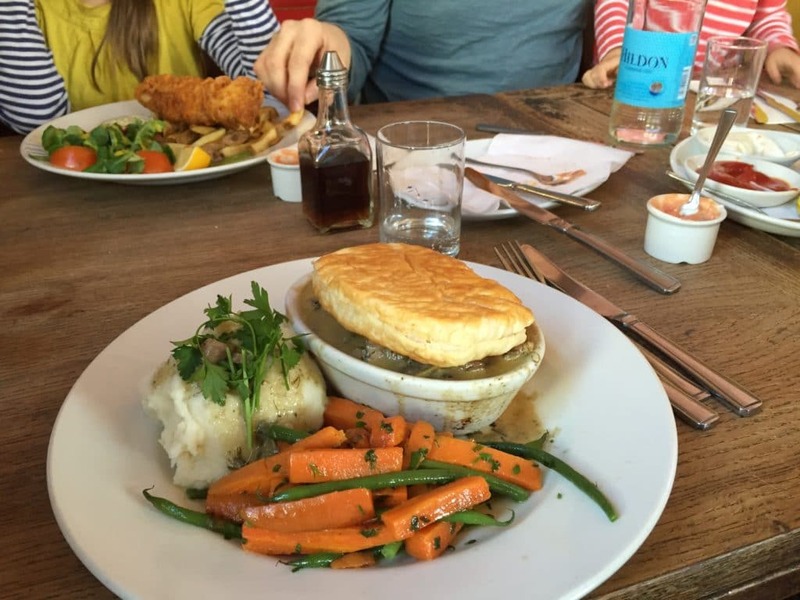 Steak & Ale Pie…he was mad that I was taking a picture before he could tuck in! Fish ‘n’ Chips with Mushy Peas. Dump salt, malt vinegar, lemon and tartar sauce ALL over that bad boy and thank me later! Street Food We couldn’t always afford to sit down and eat and sometimes we were in a hurry. Our favorite grab and go foods are Sausage Rolls and Cornish Pasties. These can be found at almost all the train stations. Most days we would grab one before hopping on the train towards home. Lamb and mint pasties are my fav, but the sausage rolls are just amazing! Delicious sausage wrapped in puff pastry. I finally learned how to make these myself before we moved. Worth every calorie! There are also Pauls and Pret-a-Mangers all over the city that are always a safe and healthy bet for a quick bite. 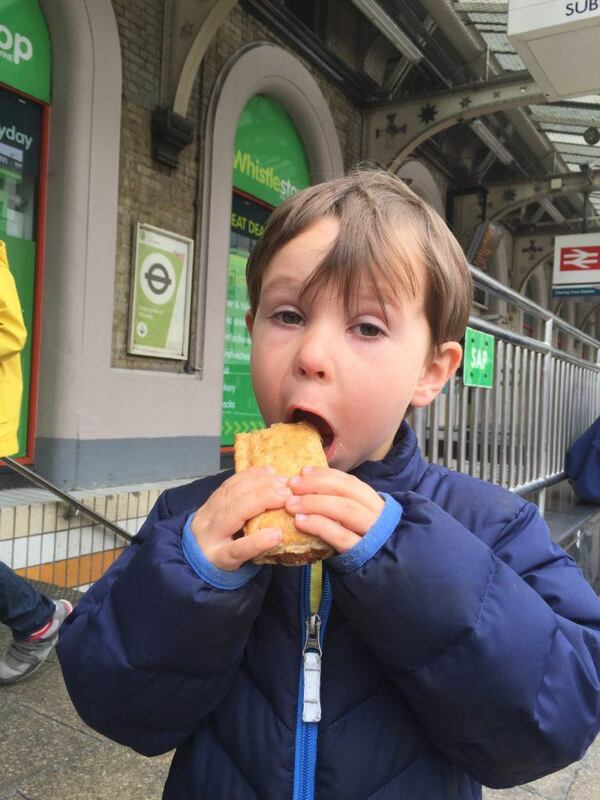 Sausage Roll at the train station! 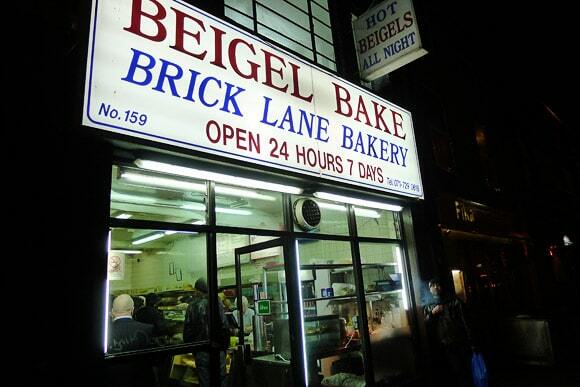 An honorable mention must be made to Brick Lane Beigel Bake which has been open since 1977 and, I kid you not, will provide you with THE BEST BAGEL YOU’VE EVER HAD IN YOUR LIFE! I went with my niece and we still talk about it every time we see each other…I can’t really explain what it is (maybe crack) but I still dream about that bagel. We took a bite as we walked down the street, then looked at each other, and wordlessly turned around and walked back in to buy some more! It was just a plain bagel with cream cheese, not even warmed! I hear they do fancier stuff, but you can’t go wrong here. It looks like the biggest hole in the wall, but you won’t be disappointed! 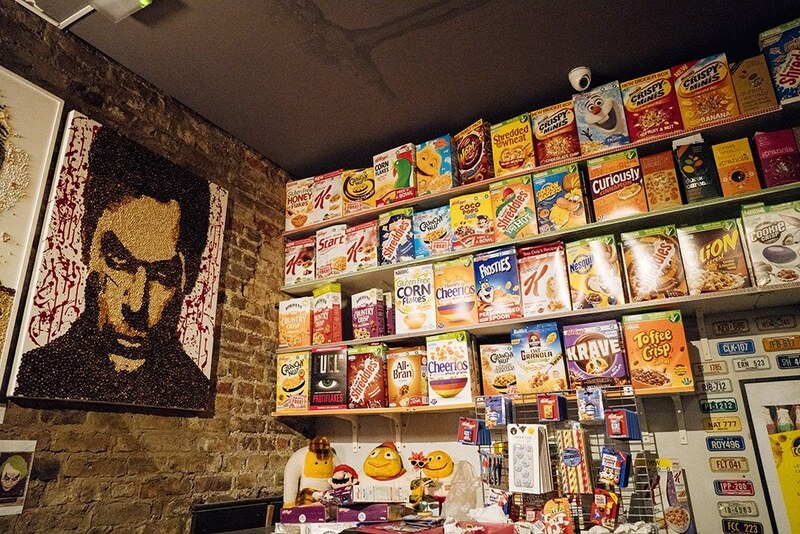 Also, just a few shops down is the Cereal Killer Cafe. This is so much fun for the kids. I recommend going for dessert rather than a meal, because it’s all sugar!!! It has an entire American section full of cereals I’ve never heard of before. haha! As we drove all over Europe, we listened to ALL of the Harry Potter Books on Audible, then watched all of the movies. So we are huge fans! 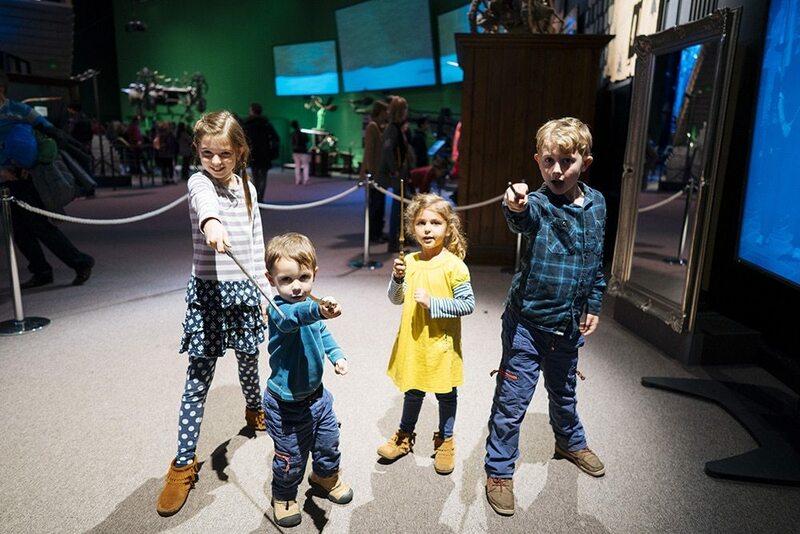 The Harry Potter Studio Tour was a huge highlight of our time in London. In fact, my older kids went twice! 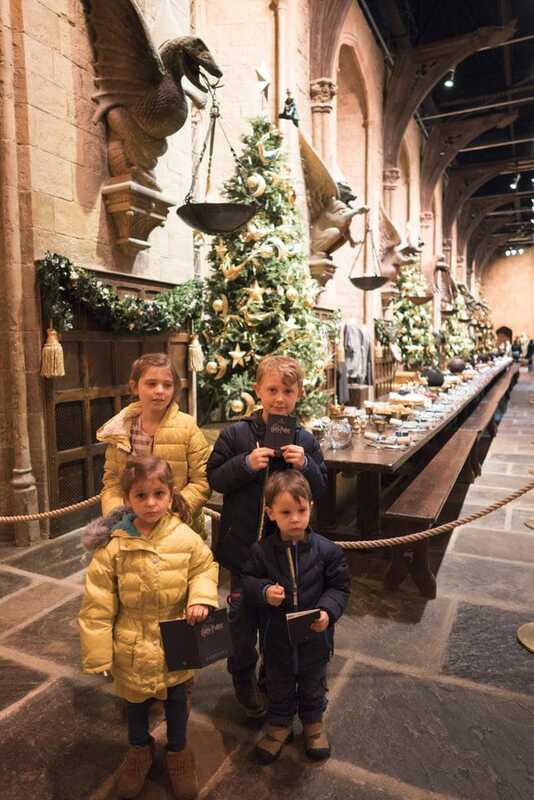 It was in December, so we got to see “Hogwarts in the Snow.” Amazing! Tickets must be purchased in advance and you can arrange transportation through the website here. It took us about an hour to drive to the studio at rush hour. Tickets are timed. 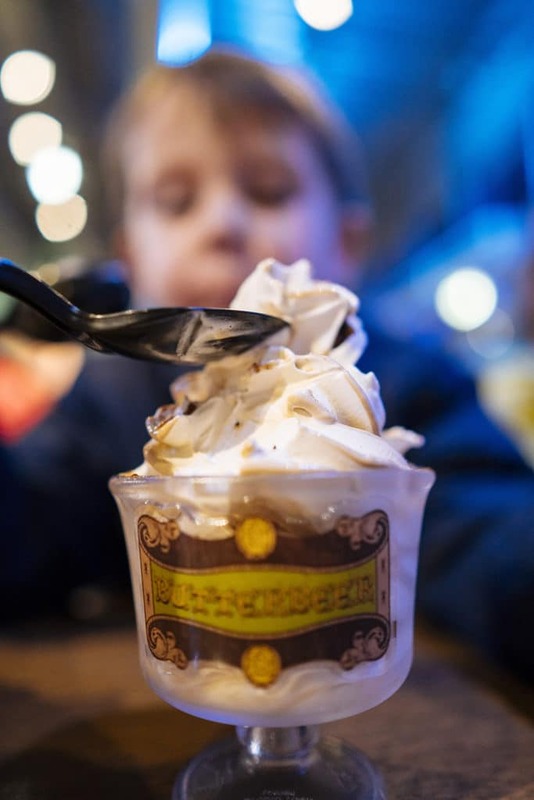 Do NOT miss the Butterbeer or Butterbeer Ice-cream (these can also be purchased in advance to avoid the lines). Harry Potter again, I know! 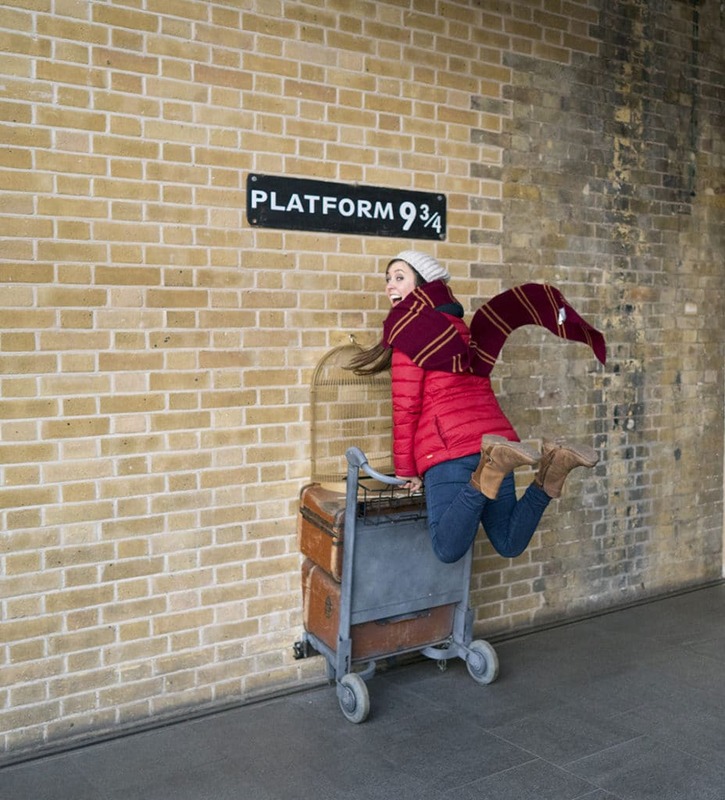 If you visit King’s Cross Station you can find Platform 9 3/4 and take a picture going through the wall. There is usually a long line and a pro photographer there to take your picture. My sister did a better job though, so I didn’t have to buy one! There is also a Harry Potter shop just to my left (oh how I wish I was JK Rowling)! 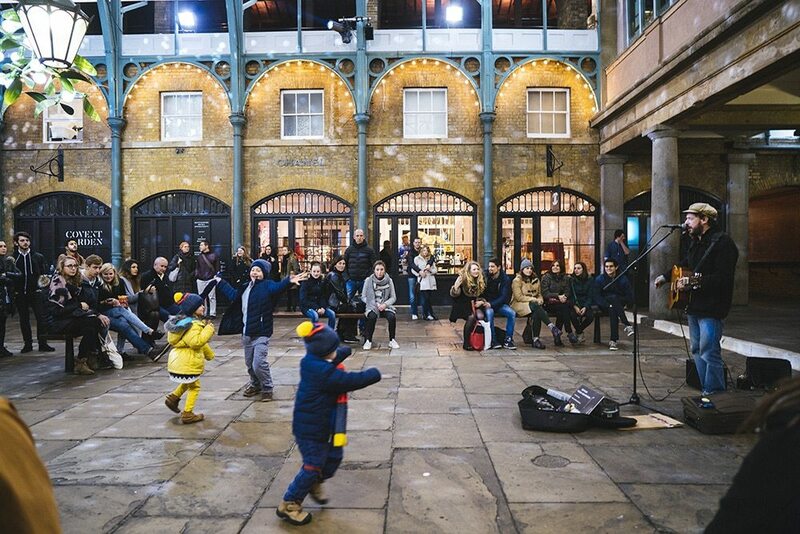 There are so many fun and talented street performers all over London. Our favorite place for this is Covent Garden. Trafalgar Square and Leicester Square are also great! 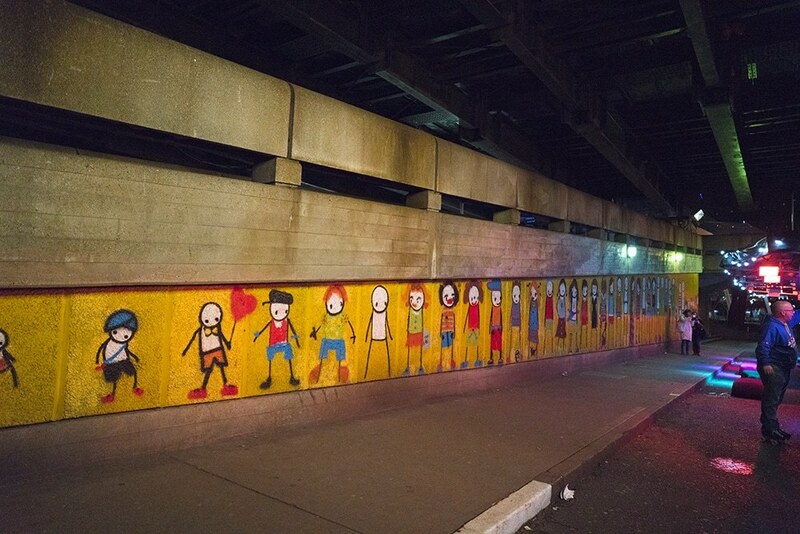 Also a great place for the kids to get their wiggles out before a show! Piccadilly Circus is like the Times’ Square of London! 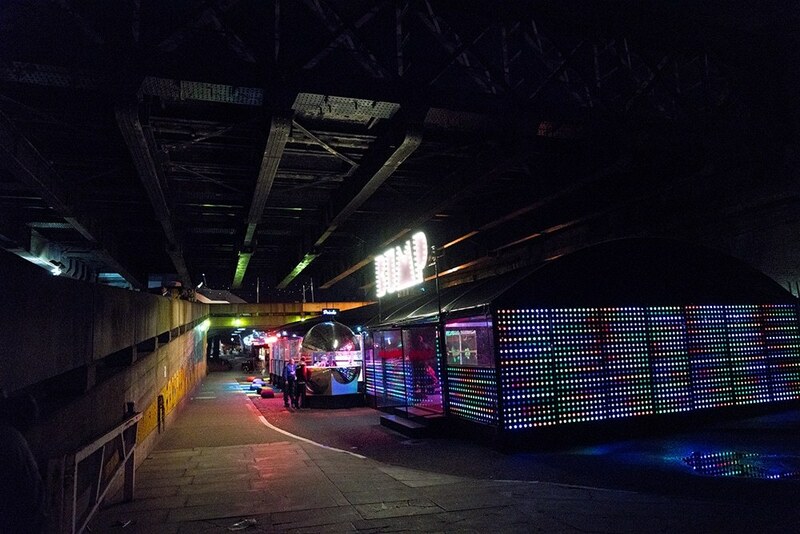 Full of lights, screens, traffic, noise and street performers (minus the naked people). Go at night…it’s fantastic! 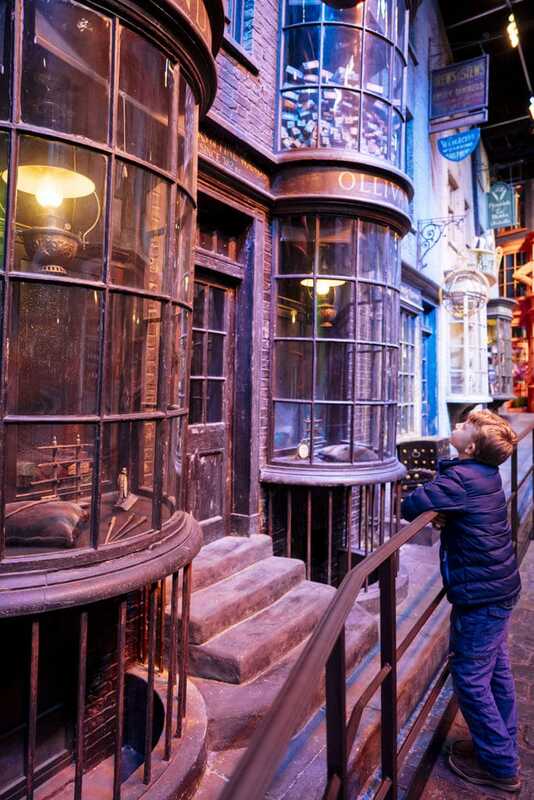 One of the reasons we love London is that there is so much amazing theater geared toward children. Not only the main-stream shows like Matilda (amazing!) and Charlie and the Chocolate Factory (fun! ), but also smaller theaters that cater specifically to children. Before Christmas we saw The Snowman which is a classic British Christmas Story, and A Christmas Carol performed by High School students at the Rose Theater (spectacular)! The Tiger Who Came To Tea is also a British classic. Other family friendly shows playing are The Lion King, The Railway Children, Aladdin, Wicked, and School of Rock. 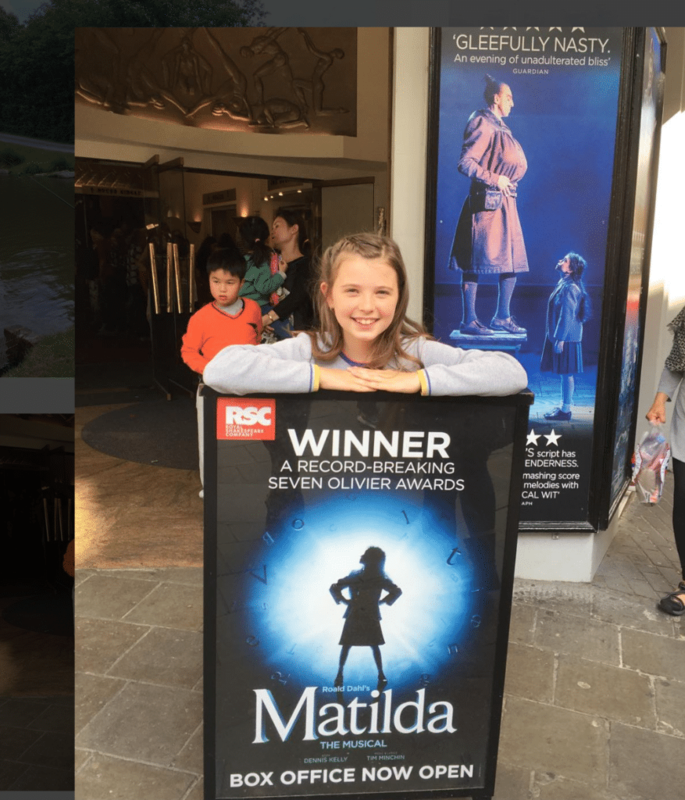 If you have to see one show in London, I recommend Matilda. It made me laugh and cry all at the same time. 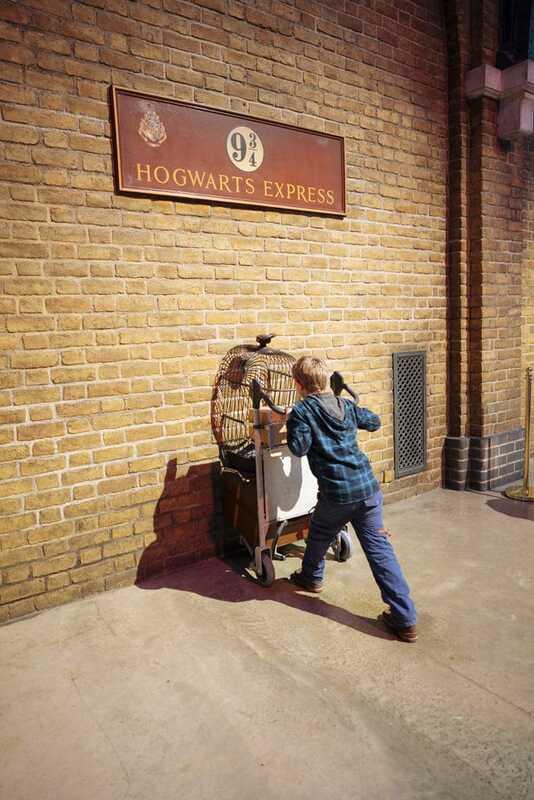 We read the book before going, which made it even more special! There are tons of museums in London and most of them are free. 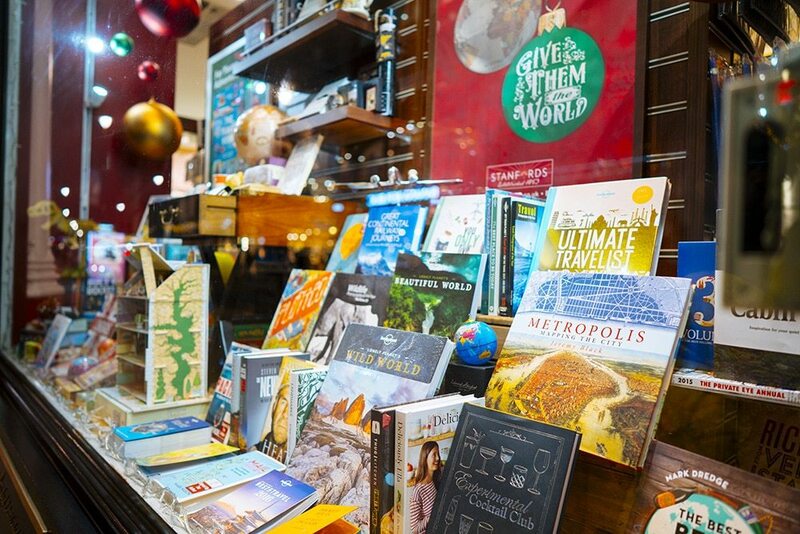 The Natural History Museum and the Science Museum are some of our favorites. The kids’ favorite was learning how a toilet flushes your poop at the Science Museum. Great! Can we go now?! Great to do on a rainy day. I wasn’t really sure what to expect from the Dickens Museum, which is housed in his original London townhouse, but it was really fun and interactive for the kids. 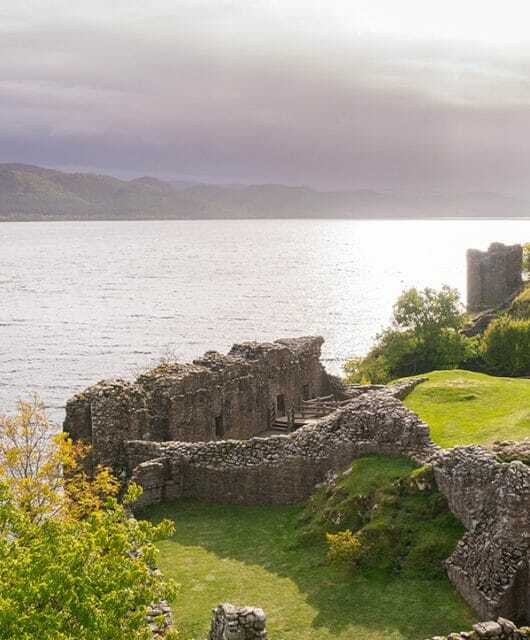 This is a great site to learn about his life and writings before visiting. 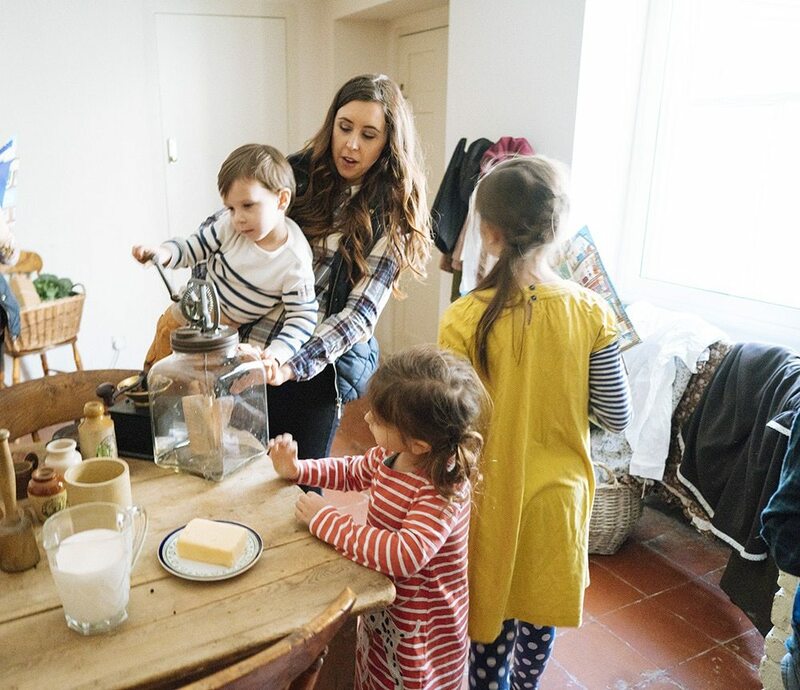 Don’t miss the nursery upstairs with the original bars from Marshalsea Prison where his father was sent to work off his debts. Note: Charles Dickens did leave his wife for another woman…my children seemed fixated and disturbed by this fact, so just a warning for you! 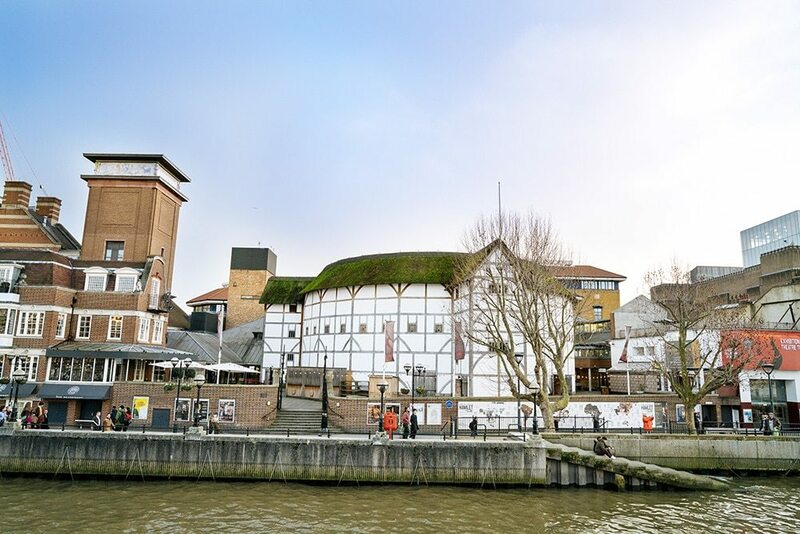 After visiting Shakespeare’s Birthplace a few weeks before, we couldn’t miss seeing the Globe Theater. You can’t just show up and see it, you have to go on a timed tour. The tour guides are mostly intellectuals so just be prepared for that. It’s not really a “fun” tour, but worth it to see the inside of the reconstruction. We were able to see players practicing which was fun. If you visit April-October you can see a show and buy 3 pound ground seats, but you have to stand the whole time! No sitting or even leaning or you’ll get busted! 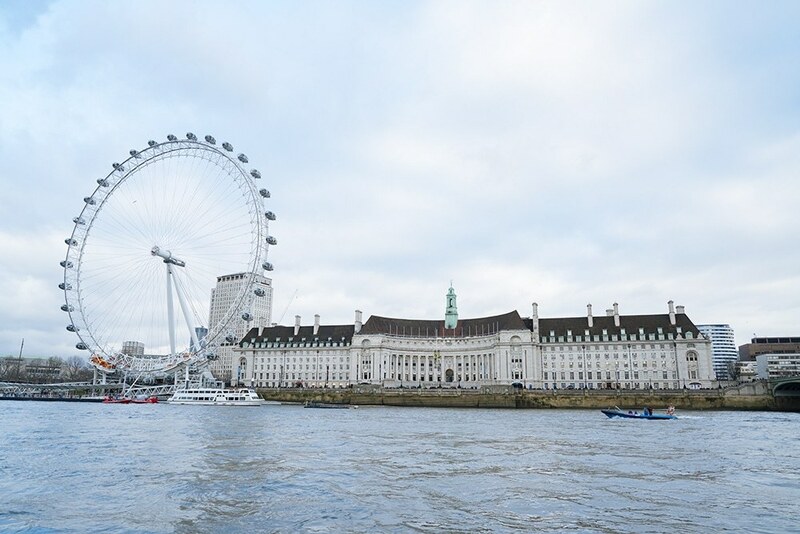 You can use your Oyster Card to cruise the Thames. It’s around 7-10 pounds depending on how far you are going. 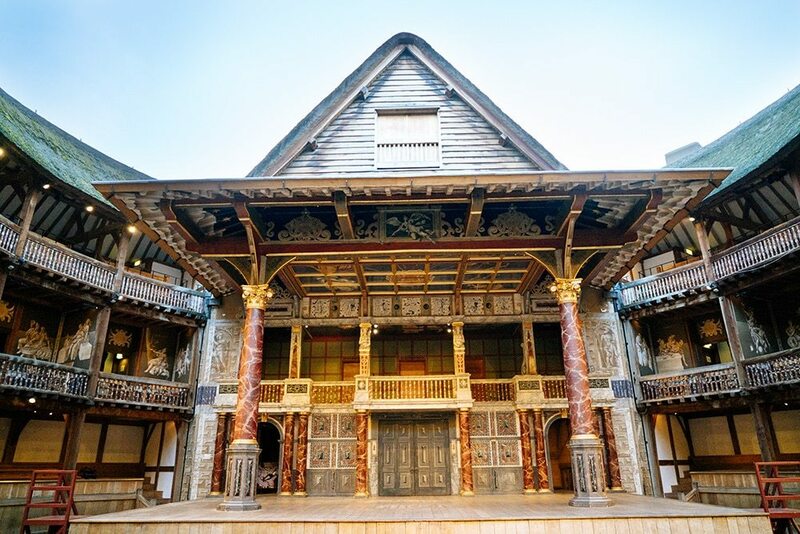 There is a stop at the Tower of London, Globe Theater, Big Ben and other landmarks. 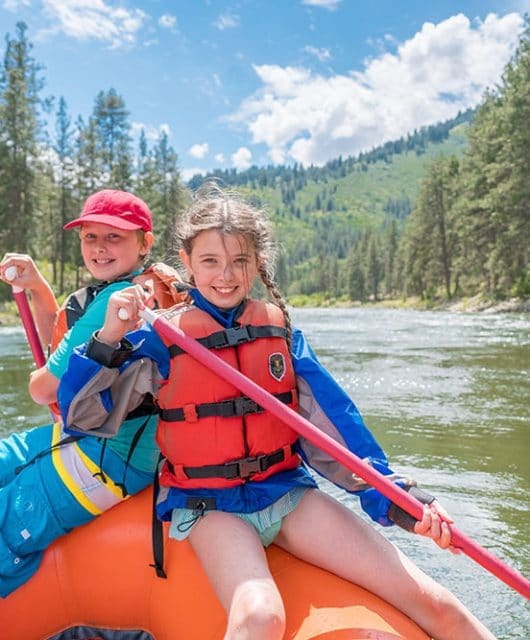 Remember: kids under 11 are free, so it may be worth it if you have a large crew vs. taking a river cruise or tour. 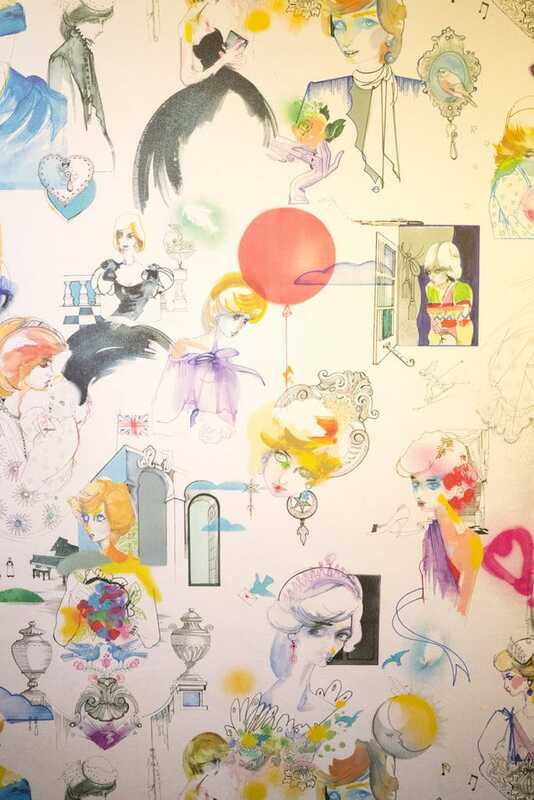 We really love this part of London when we are staying in the Marriott County Hall. It’s right by the London Eye and has such a fun night life. There is a roller rink called BUMP, a skate park (seen on Sherlock) and a hot chocolate stand called Beltane & Pop (they “adult” hot chocolates too). You also get the lovely view of the London Eye and Big Ben across Westminster Bridge all lit up at night! As you can see, there is so much to do in London! Have you been to London? What have we missed? 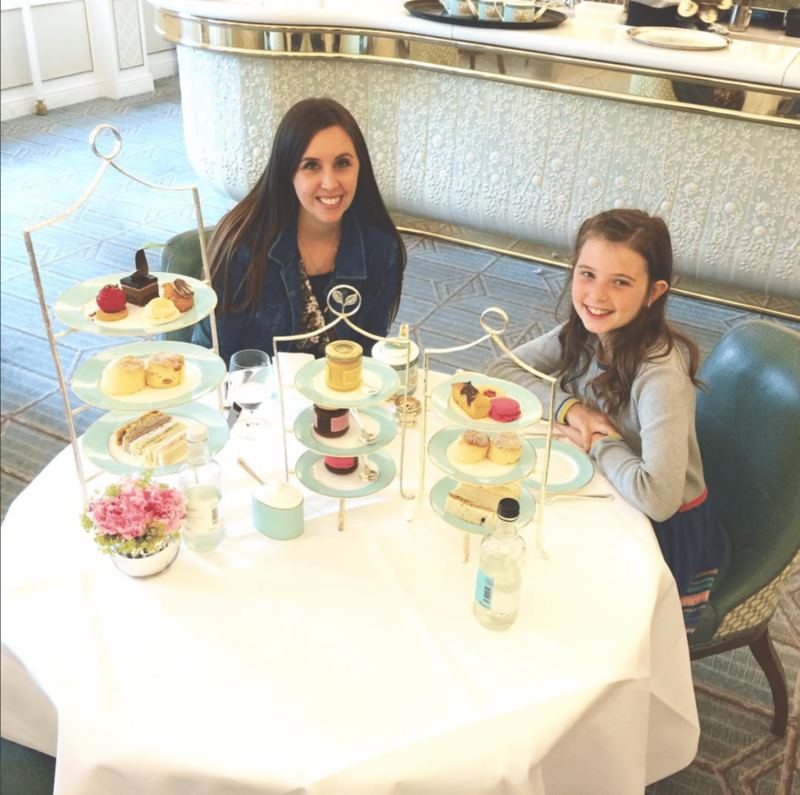 We can’t wait to go back and we’d love to try some new things when we go! If you would like to follow along with us day by day you can follow @wanderlust.crew on Instagram or on Facebook or on Twitter or sign up for our newsletter! We would love to hear from you! Such a great review! Thanks for taking the time to share your knowledge. 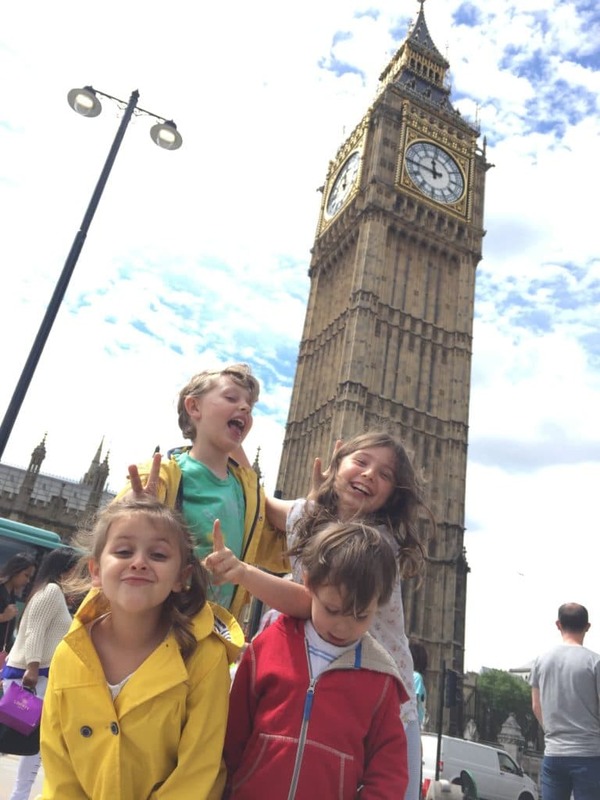 I’ve been to London many times but this time will be the first with kids, so your post has come at the perfect time. I just wished we had more time there to see everything! Will have to plan anothe trip! 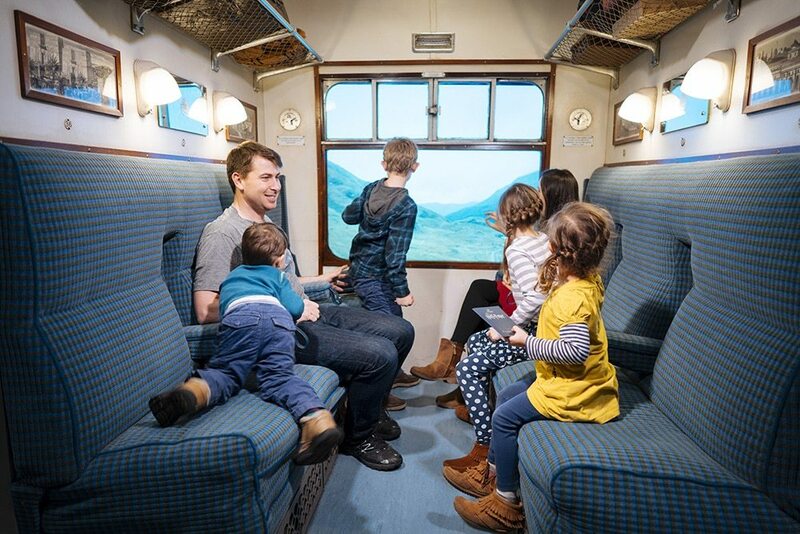 One thing that a friend of mine said was her kids favorite place is the Victoria and Albert Museum – they have backpacks apparently that her kids loved to explore the museum with. I’m going to have to include that tip in here.Thank you! We never made it to the V&A! Even after being there several months. Just so much to see and do! Have so much fun with your kids! Please let me know if you do anything that I missed here! My brother recommended I may like this website. He used to be totally right. This post truly made my day. You cann’t believe just how much time I had spent for this info! Thank you! Thanks a ton for sharing this, I saved this webpage. I’m additionally trying to find data regarding best pick up lines ever, have you any idea where I could discover one thing like this? I will be back in the future! Thanks for any other informative site. The place else could I am getting that type of information written in such an ideal approach? I have a venture that I am simply now running on, and I’ve been at the glance out for such information. I must voice my passion for your kindness in support of those who must have help with this important issue. Your real dedication to getting the message throughout has been incredibly beneficial and has continuously enabled people like me to achieve their objectives. Your new invaluable guidelines indicates this much to me and still more to my mates. Thank you; from all of us. Hello.This post was really motivating, particularly because I was investigating for thoughts on this topic last Wednesday. You’re completely right, I’d like to find out new info on this issue! I’m as well captivated by upvc back doors because I consider it’s very trendy presently. Keep it up! I’ve been exploring for a little bit for any high-quality articles or weblog posts on this sort of area . Exploring in Yahoo I ultimately stumbled upon this website. Studying this info So i am glad to exhibit that I have a very just right uncanny feeling I discovered exactly what I needed. I such a lot indubitably will make certain to do not overlook this web site and give it a look on a continuing basis. Thanks for another fantastic article. Where else may just anyone get that type of info in such a perfect method of writing? I have a presentation next week, and I am on the look for such information. Really superb info can be found on website. “I don’t know what will be used in the next world war, but the 4th will be fought with stones.” by Albert Einstein. Pretty nice post. I just stumbled upon your blog and wished to say that I have really enjoyed browsing your blog posts. After all I’ll be subscribing in your rss feed and I’m hoping you write again soon! Respect to post author, some fantastic selective information. Have you ever thought about writing an e-book or guest authoring on other blogs? I have a blog based on the same ideas you discuss and would love to have you share some stories/information. I know my readers would value your work. If you’re even remotely interested, feel free to shoot me an e-mail. Great site. Plenty of helpful info here. I¦m sending it to several pals ans additionally sharing in delicious. And certainly, thank you on your sweat! Great post, I think website owners should larn a lot from this web site its really user friendly.